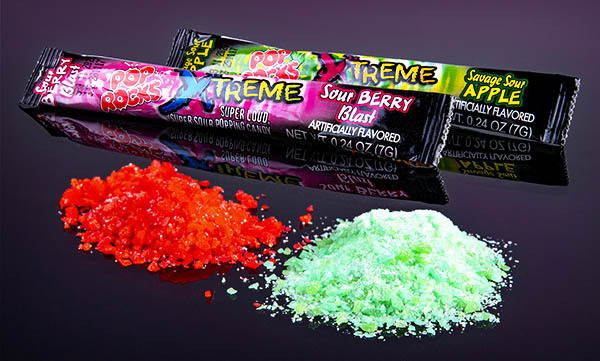 Extreme Pop Rocks: Super-loud sour popping candy. Wake up your taste buds with the extremely loud sound and the big taste of Extreme Pop Rocks. Each tube contains a generous portion of the classic hard candy crystals that have been amped up to fizz even louder than the original. Available in delicious sour flavors like Sour Berry Blast and Savage Sour Apple, each pour will have you drooling for more decibels. Note: Because Extreme Pop Rocks are delivered to us assorted, your flavor will be chosen at random. Buy two pouches and save! OK, maybe not deafening, but Sour Extreme Pop Rocks are LOUD! The familiar pop and fizz of Pop Rocks have been amplified to levels never before tasted, and the powerhouse pop is paired with extra sour flavoring to create a sensation that's truly extreme. Candy that goes to 11! Sour Extreme Pop Rocks come in two super-sour, super-loud, super-delicious flavors: Savage Sour Apple and Sour Berry Blast. Because of the way the pouches are shipped, we can't guarantee which flavor you'll get, but we can promise each one is a delicious thrill ride for your taste buds and a rock show for your eardrums. You'll be surprised by the extreme taste and popping of a surprise flavor. Question: What are the ingredients? Asking for a kid that has allergies. Answer: Sugar, Lactose, Corn Syrup, Citric Acid, Artificial Flavor, Artificial Color (Red 40, Blue 1, Yellow 5). Processed with Carbon Dioxide. Contains tartrazine. Question: Can I make myself explode if I eat these and drink soda at the same time? Hollow balls of gum that contain Nerds candy. Classic Pixy Stix with flavors from south of the border. A jumbo version of the classic sugary treat.